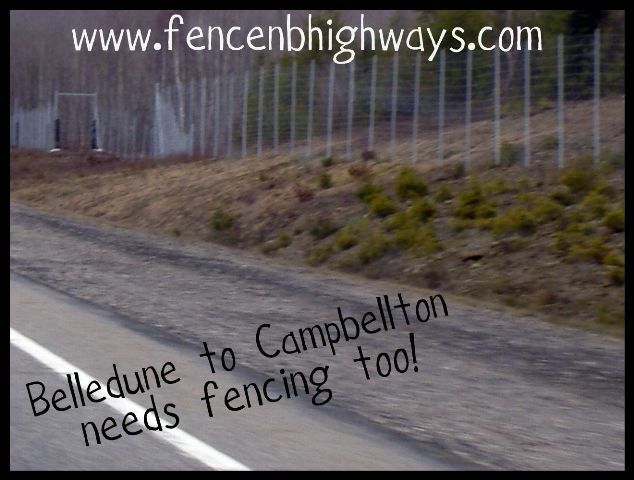 Fence New Brunswick's Highways! this site is aimed at whatever party is in power in this Province to get them to erect wildlife fencing. I have dealt with the PC's and the Liberals. Now Brian Gallant and the Liberal Party are no longer in control. This site is intended to get the message across to the Province Of New Brunswick and its leaders to realize the Vehicle/Moose Collision's happening here. It is a deadly problem and something has to be done to solve this. If we all work together, something can happen, and innocent lives will be saved. Right now as of April, 2019 my concern is Highway 11 in the north particularly Belledune to Campbellton. that stretch of Highway is Deadly! They have constructed Moose warning signs but thats not enough. HIGHWAY 11 HAS HAD 11 DEATHS since the year 1999. I have facts in my timeline to account for all these deaths, now this is 10 deaths in 20 years but thats not counting all the collisions and near deaths Highway 11 has seen. This area has been the worst for moose/vehicle collisions!! a man was killed when he collided with a moose near the osprey truck stop on highway 11 in the north right near the exit to Dalhousie!!!! this furthers my case that this area needs fencing ASAP!!!!! whether its in the north or the center of the province on highway 11. FENCING NEEDS TO BE ERECTED! WAKE UP YOU POLITICIANS! 1 MORE DEAD PERSON!!!! !THIS IS JUST THE LATEST TRAGEDY ON HIGHWAY 11. my work has saved lives on our highways, I'm very proud of that. COME ON POLITICIANS!!! STOP THESE COLLISIONS FROM HAPPENING!!!!! !STOP THESE DEATHS FROM HAPPENING! EMAIL THE MLAS/MINISTERS. Please sign up to the new and improved message board and post your thoughts about this serious subject. if you do not see a table of contents on the left side please type in the address listed below and you will see the full site. OLD UPDATE from 2017-2018 below, but Last Updated April 21, 2019. my site is going to go through a complete overhaul in every section of the site which needs updating, i'm quite busy with other things.. my 3 yr old daughter just beat cancer. we're so happy!! plus i also have a son who is 7. ! my email is ceo@fencenbhighways.com -at one time it was webmaster@fencenbhighways.com but that address I don't use anymore after a server crash in 2007 where i had to renew my domain, so if you do a look up it says i registered www.fencenbhighways.com in early 2007. but in actuality i first had it registered in early 2003.. And my twitter is @cliffdimerandy and over 17,000+ Youtube followers. reach me through these 2 ways. My page is best viewed with Internet Explorer or Google Chrome.